This piece originally appeared at Information Dissemination. 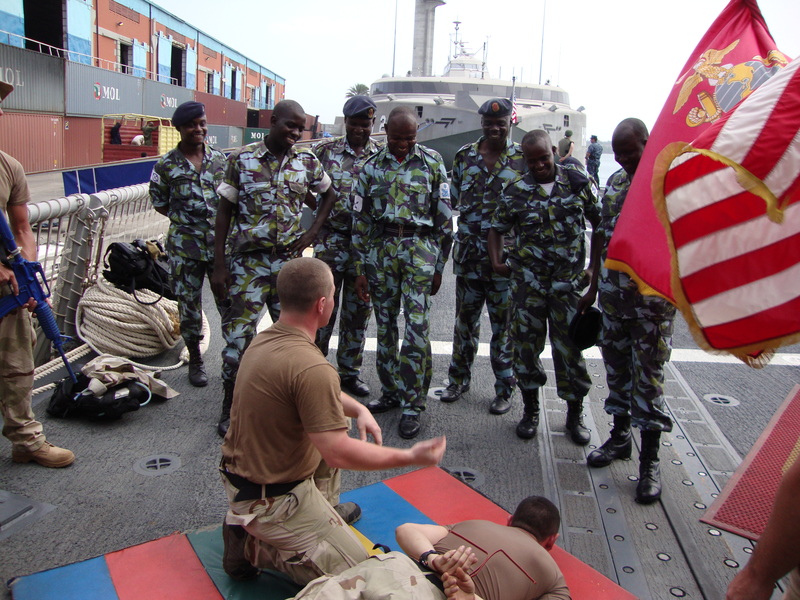 USS NICHOLAS (FFG-47) Visit, Board, Search, and Seizure (VBSS) team members train Kenyan naval personnel on proper apprehension techniques while in port Mombasa, Kenya during Africa Partnership Station – East 2010. West Africa today is plagued by a variety of serious maritime security (MARSEC) concerns. Illegal, Unreported, and Unregulated (IUU) fishing, trafficking of persons, arms, and drugs, oil bunkering, illegal migration, and piracy have contributed to a maritime environment characterized by crime and corruption. The costs of these illegal activities are significant; the cost of illegal fishing alone is over $1 billion US Dollars annually, and an estimated 600,000 people are trafficked illegally each year. Pirate attacks targeting oil product vessels in West Africa are occurring with increasing regularity, and are becoming increasingly violent. Like much of the rest of Africa, the nations of West Africa have traditionally held a land-centric view of security. National navies, as well as other maritime entities such as coast guards and fisheries patrols, have never been in the vanguard of training or financial investment. Despite this, recent years have seen a renewed focus on maritime security in West Africa, driven by concerns of piracy, threats to oil production, and international programs of assistance. Many nations and organizations have strategic interests in building strong MARSEC partnerships with West African nations, most in the hopes of protecting or establishing maritime enterprise relationships. The United States Department of Defense (DoD) Strategic Doctrine for 2012, Sustaining U.S. Global Leadership: Priorities for 21st Century Defense, discusses the importance of partnerships around the world, including those in Africa. This document sets forth a goal to “become the security partner of choice” in nations of interest, and advocates an “innovative, low-cost, and small-footprint approach”, with an emphasis on exercises, rotational presence, and advisory capabilities. West Africa holds particular strategic significance for the United States, and European partner nations, and not only for its vast reserves of energy resources. The region is also an advantageous safe haven for terrorist and transnational criminal groups, a transhipment point for drugs being trafficked to Europe and further, and its ports are key components of the global maritime transportation network. Capacity building is the most effective approach to building a sustainable, self-reliant maritime security environment in West Africa, whilst keeping to the small-footprint approach outlined by the DoD. These partnerships and training efforts allow regional nations to directly counter MARSEC threats within their domains, leveraging the vast experience in maritime operations provided by partner nations. They encourage a two-way exchange of ideas and skills, and allow participants from U.S. and European nations to get a glimpse at the problems plaguing the region first hand. Africa Partnership Station (APS) is a U.S. Navy (USN) initiative designed to facilitate events that foster cooperation between African nations, the U.S., and European partner nations with the goal of developing maritime safety and security capabilities on the African continent. The partners of APS work together through both sea and land based engagements, focusing on a broad range of MARSEC-related operations, joint exercises, and professional training programs. These endeavors focus on four main pillars of capability: Maritime Domain Awareness, Maritime Professionals, Maritime Infrastructure, and Maritime Enforcement. A highly unique and advantageous aspect of APS is that it requires no permanent land base, as the ships participating act as the ‘base’ for engagements and training. This allows the USN to follow the small-footprint approach outlined in the Sustaining Global Leadership document, and leaves assets available for re-tasking if high-priority situations arise in the region. The African Maritime Law Enforcement Partnership (AMLEP) is a US Africa Command (AFRICOM) program that focuses on assisting partner nations within Africa with a view to building stronger maritime security through cooperative real-world law enforcement operations. Partner nations work directly with the U.S. Coast Guard and/or U.S. Navy whilst conducting operations to counter common security threats such as IUU fishing, trafficking of weapons, people, or narcotics, and so on. This decreases the reliance of West African nations on foreign assistance to counter common MARSEC threats in the region, as well as enhancing operating cohesion, and fostering trust and confidence between partnering nations. Private Security Companies (PSCs) also play a role in capacity building operations in Africa. One such company, Triton International Ltd., has conducted extensive training of the Somaliland Coast Guard, developing their capabilities to respond to a variety of threats in their area of responsibility. Similarly, PSCs are participating in training local navies and coast guards in West Africa, and are even augmenting local coast guard and fisheries patrols in some cases. PSCs can play an important role in building maritime security capacity in West Africa, lessening the burden on the world’s navies, and allowing programs such as APS and AMLEP to target areas of specific interest or concern. All of the above initiatives, as well as a handful of others falling outside the scope of this article, are innovative approaches to engaging with African nations in efforts to develop stronger local maritime presence, self-reliance, and response capabilities. However for these partnerships to be effective, especially in Africa, there exists a need for carefully structured milestones, robust oversight and accountability, and end state definitions that outline success. More can be done in order to prove that investment in African nations can provide a truly sustainable, self-reliant, and effective maritime presence. There is a common need for nations, commercial interests, private security companies (PSCs), and non-profit organizations to build cooperative partnerships with the nations of West Africa in order to develop MARSEC capacity in the region. US involvement should follow an interagency (‘whole of government’) approach, synergising the efforts of the DoD and the various services (particularly the USN and USCG), Department of State, Drug Enforcement Administration, and other USG stakeholders. Such interagency programs have enjoyed regional success in areas such as Colombia, and would be ideally suited to tackling the multifaceted challenges presented by the West African situation. The numerous challenges of building a sustainable partnership and self-reliant West African maritime capability are widely recognized and understood. Most West African nations have a widely-acknowledged problem with corruption and nepotism, and the efficiency of military and civil command structures are often in question. Additionally, there is the challenge presented by integrating the efforts of the wide range of stakeholders seeking to promote enhanced MARSEC in West Africa. Nonetheless, much of the groundwork for achieving these goals is already in place, and it would require a comparatively modest investment to begin making a real impact. The lacking pieces of the puzzle are a unified strategic plan, and a designated body to coordinate various agencies’ and nations’ efforts. The tactical level: Develop a cooperative training and engagement program consisting of navy, coast guard, and private security experts from around the world to continue building upon previous and current training in maritime operations, education, administration, and other relevant areas. The operational level: Develop a cooperative assistance program aimed at upgrading and maintaining maritime infrastructure in critical West African ports. Establish an interagency body tasked with coordinating maritime capacity building operations throughout the region, and recommending the best distribution of surplus US and European materiel gifted to nations in the region. The strategic level: Engage with individual West African nations, as well as ECOWAS and the African Union, through high-level exchanges across the interagency. Establish an interagency framework to organize MARSEC development at the strategic level, directly supporting U.S. and partner nations’ foreign policy goals. These engagements should focus on laying out a framework to work towards a sustainable end-state; the development of an effective, self-reliant maritime capability in West Africa. If the U.S.’s strategic plan is to consider the benefits of West African partnerships seriously, then creating an international group that mirrors many aspects of the Contact Group on Piracy off the Coast of Somalia to fill the role as the ‘Contact Group for Maritime Security in Africa’ would be an admirable first step. Such a body should be responsible for the tiered approach outlined above, coordinating both interagency and international participation in programs to strengthen the MARSEC capabilities of nations throughout Africa, tailoring exercises, training, and operations to suit US and partner nations’ foreign policy goals, and reducing confusion and overlap between programs from different countries and agencies. Generally accepted to be the 15 nations comprising ECOWAS, plus Mauritania. Including but not limited to the US DoD’s Gulf of Guinea Guard Initiative, Maritime Liaison Officer (MARLO) programs, the Maritime Security Centre (Horn of Africa), and programs administered by the EU’s CSDP. Chad Hutchins is a Lieutenant in the United States Navy, currently attending the Naval Postgraduate School. He has previously served aboard ships participating in capability development operations in Africa. The opinions and views expressed in this article are those of the authors alone and are presented in his personal capacity. They do not necessarily represent the views of U.S. Department of Defense, the U.S. Navy, or any other agency. USS NICHOLAS’s Anti-Terrorism/Force Protection (AT/FP) training team trains Mauritian commandos on team movements while securing a pier during a security alert exercise in Port Louis, Mauritius. USS NICHOLAS’s VBSS team trains the Mauritius Police Force on proper search techniques while in Port Louis, Mauritius. This entry was posted in Counter-piracy, Law Enforcement, Regional security and tagged Africa, amlep, APS, counter-piracy, EUNAVFOR, MARSEC, piracy, Somalia, US Navy, USN, west africa by N.R. Jenzen-Jones. Bookmark the permalink. N.R. Jenzen-Jones is a military arms & munitions specialist and analyst focusing on current and recent conflicts. He is the Director of Armament Research Services (ARES). He has produced extensive research and analysis on a range of small arms and small arms ammunition issues, as well as providing technical assessments of incendiary weapons, emergent arms technology, and arms proliferation. Mr Jenzen-Jones’ other research fields include the exploitation of technical intelligence to support counter-piracy, counter-narcotics, and other operations. He is an armourer certified on several Western and Eastern Bloc weapons, including AK series rifles. He is an ammunition collector, and a member of the European Cartridge Research Association, the International Ammunition Association, and the International Ballistics Society. That’s a very nice article man. Interesting stuff.